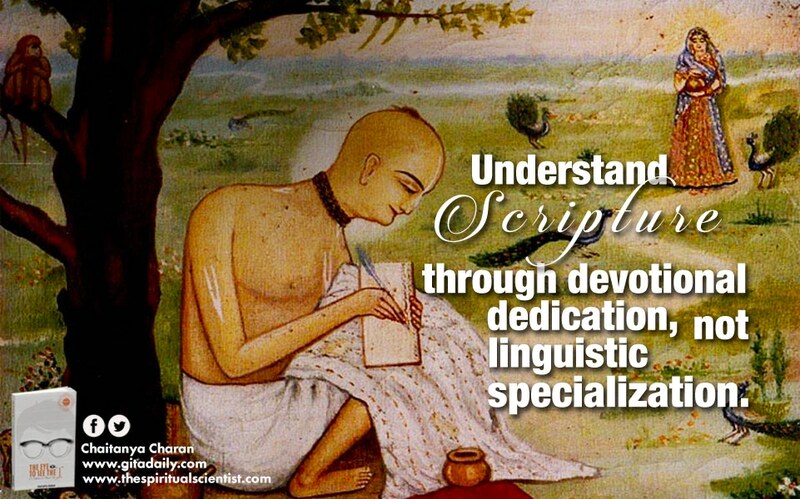 Some people think that learning the language of scripture is vital for understanding it. Thus, they feel that only Sanskrit scholars can understand the Bhagavad-gita. Taking such reasoning further, we could say that the Gita is not just a Sanskrit book – it is a Sanskrit book about philosophy. Because philosophy is a complex body of knowledge, understanding it requires its own specialization. So should the Gita be reserved only for super-specialists who master both Sanskrit and philosophy? Not at all – it is a manual for living for all people. The Gita is essentially a spiritual revelation transmitted from the divine heart to the human heart through a chain of devoted hearts. Its innermost import can be understood only through the devoted heart, with the head being used as an assistant. 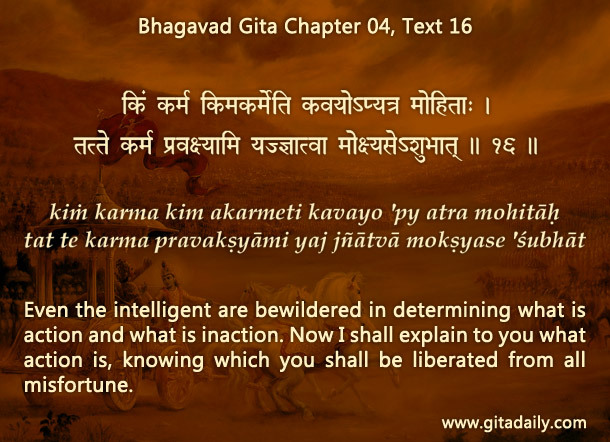 Consider, for example, the Gita (04.16) statement that even the wise are bewildered about karma and akarma. From a literal linguistic perspective, karma means activity and akarma means inactivity. Even a child can understand whether someone is active or inactive – why, then, should it bewilder the wise? Because the words ‘karma’ and ‘akarma’ are used here in a philosophical sense. Karma connotes action that produces reaction and akarma, action that produces no reaction. Understanding which work begets reaction and which doesn’t is not easy – it is a conundrum that can vex even scholars of language and philosophy. Gita wisdom explains that reaction results from motivation, not from action per se. When we work selflessly for Krishna’s pleasure, he by his inconceivable omnipotence frees us from all reactions and bestows the supreme liberation. This is the Gita’s full blessing, a blessing that is relished not by critical intellectuals who sweat over its linguistic technicalities, but by committed lovers of Krishna who shape their hearts and mold their lives according to his words. Very nice explanation of the verse Prabhuji. It shows how we have to understand The Bhagawat Gita.